=) Thanks for the comments. Fantastic! Very, very beautiful and the light from behind really enhances the Orchid. 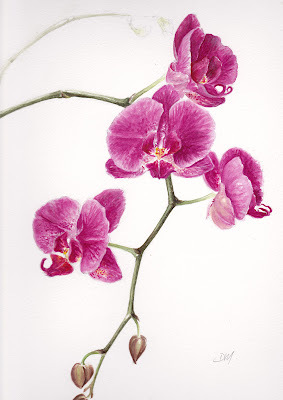 These orchids are amazing -- so graceful and the color is beautiful! Lovely, beautiful detail, color and shading. They look like they could breathe. Thank you for sharing it. Oh- this is gorgeous! I love the purple color and the delicate petals. You are a master. Botanical Art http://groups.yahoo.com/group/botanicalart Join an international forum for artists, photographers, fanciers, directors, dabblers, doodlers, illustrators, collectors, calligraphers, crafters, naturalists, gardeners, botanists, scientists, growers, explorers, directors, writers, journalers, educators, birders, shopkeepers, curators, printers, historians, enthusiasts...the curious [whew]. Dedicated to the realistic portrayal of plants, flowers, natural science subjects.